The Miniature Apocalypse: Ork HQ, WIP. 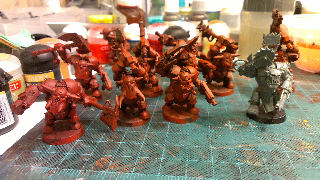 Here is a sneek peek at my Ork Nobz and homemade Painboy and heavily modified Ghaz. 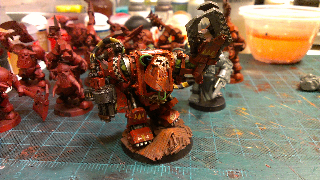 For the Nobz I modified the WFB black Ork box set. I wanted to make them look like they have the 'eavy armour option. I'll post more on this WIP when I'm done.